Stores reference 22c/581-4. Unknown size but perhaps a '2' or '3'. Cotton canvas helmet intended for use in tropical/desert climates in the Middle East, Mediterranean, North Africa etc. and incorporating a neck flap at the rear to provide sun protection. The material is in excellent overall condition bar light soiling. Good goggle straps with most studs retaining the majority of their original coatings. The rubber receiver carriers on this first pattern helmet are stitched externally and have a large exposed 'flange'. They are in excellent fully flexible condition. The helmet's satin lining & inner donuts are equally good and damage free. Both felt panels (inner forehead area and back of chintab) remain in place, both with minor moth nips/trailing. The leather chinstrap is very good, retains the metal end tip and the Bennett buckle is complete with leather covering. 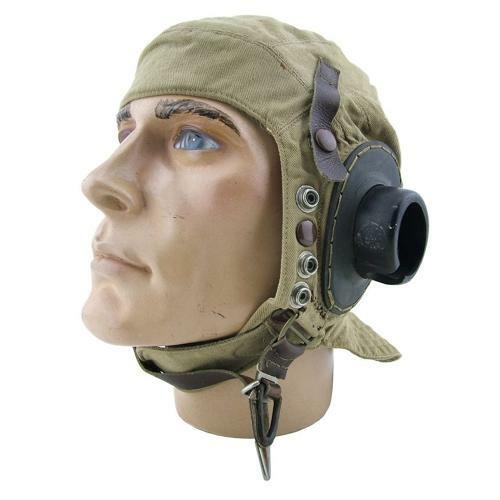 This helmet is studded for use with both the Type D oxygen mask and later E and G-series masks. Sold unwired and without receivers but these can be supplied separately if required. An excellent used example of this rare early variant. Stock code H22990.